Our program reached 22 Ghanaian girls aged 14 - 20 enrolled at the Soronko Academy: West Africa's first coding and human-centered design school. We asked the students to help us design our mentoring and advancement program: Girls MAP so that we could be impactful in our delivery - giving them the skills, knowledge, and resources they truly need. First, they told us about their future aspirations. "What is your biggest dream: the one that you are too afraid to say aloud and claim for yourself? What do you want for your life, career, family?" The girls admitted that they had never been asked what they wanted out of life, but as soon as I gave them the post-it notes to write down their biggest dreams, they couldn't stop jotting. We got responses like, 'to be a light in my community' 'to impact future generations' 'to be an undefined success. no boundaries' and 'to have multiple streams of income.' What struck me most was that none of the responses had anything to do with material possessions. Then, we discussed how Girls Trip Tours could support their aspirations and eliminate some of the barriers preventing them for achieving success through Girls MAP. Next, we had a future careers advice session. The goal was to give the students tangible blueprints of future careers, as well as the confidence and connections to pursue them. We had a panel conversation with influential women including a recent Yale University grad, LinkedIn product manager, a Columbia University student, an eBay information architect, a former Ford foundation executive, an Obama Fellow, and a Forbes Africa 30 under 30. We then broke up into small groups based on interest so that students could ask more pointed questions to their mentors. I led a workshop on creative strategic foresight, which taught the girls to better observe their environments, connect the dots, spot opportunities, and be prepared for different future scenarios - regardless of how likely or unlikely they may seem today. I work as an Innovation Strategist and wanted to introduce the girls to something new. However, this was by far the most challenging content to deliver, but in the end I could see it click for them, especially when we began making the very abstract concepts quite personal. Me: "Can someone give an example of a possible future scenario?" Me: "Ok, continuing with that example, what would be a more plausible future scenario?" Me: Haahahaha. Yup, you got it. Lastly, I asked each girl to write a letter to her future self. "How do you want your life to change by next year? How can you encourage yourself to dream bigger and ensure that you achieve your goals? Write a letter to your future self with advice and encouragement based on what you learned today." Next year, on July 2nd, 2019, I will email the letters to the girls and check in on their progress with these goals, as well as learn what their new aspirations are. The Game Design Workshop was led by Eyram Tawia of Leti Arts, one of Africa's first game design companies and the award-winning creator of the popular African Legends comic series. The goal of this session was to give the girls another example of where they can focus their creative energy and encourage more girls to pursue game design and development as a career path. One of our 14-year-olds, who idolized the instructor and his African Legends comic series, was offered the opportunity to pursue an internship with Leti Arts after I told him of her talent for illustration and she showed him her sketch book. We officially launched our mentoring program with a brunch event at one of Accra's trendiest restaurants. We had a fun custom menu prepared and invited more influential women to network with the girls. They couldn't stop smiling and taking selfies. "I'm just so happy," said one of the girls at least 20 times before the brunch ended. I could see it on their faces, they felt like queens for the day. I was impressed at how quickly the girls had found their voices. On Day 1, they were so shy and I could barely hear their responses. A lack of confidence was one of the most prevailing themes in the barrier section of our dream board. By the brunch event, they were introducing themselves to our guests and networking like pros. This made me incredibly proud because without confidence the new skills they learned would become much less effective. “We were once where you are. You can be everything you admire about us and more." "The solution to your life's greatest challenges is already within you. Dare to unleash it." "We know it's easier said than done, so we are here to help." The girls were bold enough to ask for a more technical game design workshop that delved deeper into the back-end development versus concept design. I am working to make that happen this summer before school resumes. In any case, I hope to return to Ghana next year for continued programming with the amazing girls of the Soronko Academy. Thanks to everyone who donated to our crowdfunding campaign and made this possible! My ultimate goal is to lead workshops like this in several countries around Africa and create a network for these future leaders to share ideas across borders. 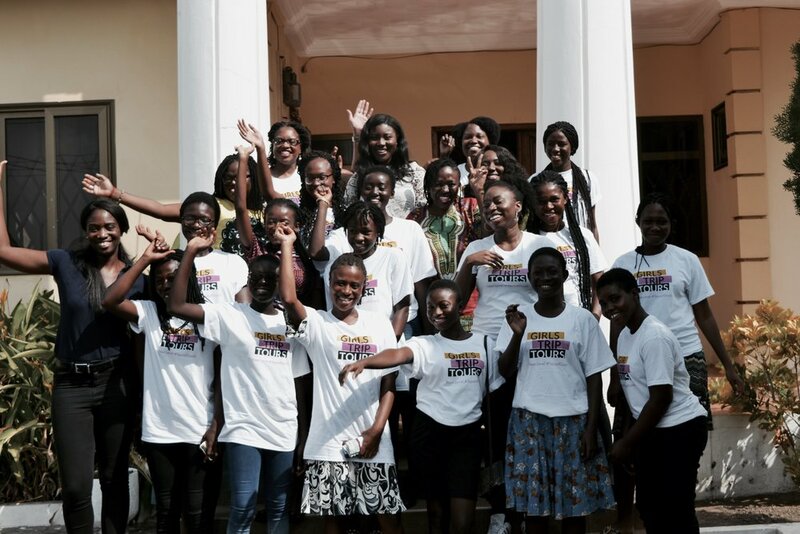 From the girls I met in Ghana, I am confident that Africa's future will be in safe hands. It is now my generation's job to inspire, empower, and connect them to opportunities and resources, so they are prepared for success. "Girls trip was the time of my life! At first I was a bit intimidated by the high cost. However, during the trip with our personal photographer, the endless meals, and all-day driver made every moment perfect. I loved the mentoring aspect of the trip and still keep in touch with some of the girls. This was my first time in West Africa and it made me so excited to return. There was so much inspiration, self-love, and joy surrounding this trip. Temi was a great host and it was even more exciting to get to meet the local influencers." Want to join our next trip?